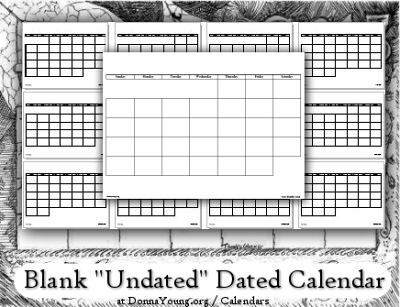 DonnaYoung.org has many styles of Printable calendars. Browse the list below or visit the links in the menu above. All calendars are updated each year around August first. 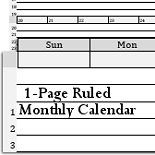 If you are looking for my school attendance calendars, please go to Homeschool Planner > Administrative > Attendance. The calendars at Organizers & Journals are the type that one uses to organize their day or to record some details about their day. While most of the calendars fit well in an ordinary binder, a few are designed to be pinned to a corkboard or hung on a wall. What are blank calendars? A blank calendar is a little more than just squares on paper. A useful teaching calendar and an art project wrapped up in 12 monthly pages. While the numbers are missing from the months, this calendar is most certainly dated. Year - One year on one page. Events - Record events such as appointments and so forth. How I Taught my Children about the Calendar - This page briefly explains how I taught my children about the calendar. Teaching Days and Months - Thirty Days Hath September - This page includes two different ways to remember which months have 30 or 31 days and printable files.